Trailriding through the beautiful hills op Cercal. Come and ride with me through the beautiful green hills of Cercal. 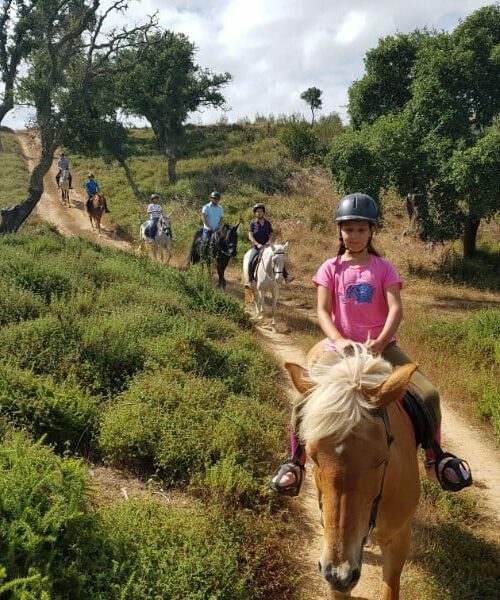 A 50 minute ride on calm and sure footed horses will take us through the green hills, surrounded by cork-oaks and medronho- trees, all natural vegetation in this part of Portugal. Most likely we will meet the herd of sheep and goats roaming freely through these hills. Coast and Beach rides near Vila Nova de Milfontes. Join me on a fantastic trailride! Breath in the fresh ocean breeze! Enjoy magnificent views through the ears of our gentle horses and happy horses. Together we will ride through the sanddunes, along the cliffs and during most of the year the 1h30 trailride will ride on the beach. You can choose between 2 trailrides.